Thu., Mar. 3, 2016 2:30 p.m. According to Cally Jordan, repeated international financial crises have prompted the call for concerted international action, most significantly in the form of creation and implementation of international financial standards. The experience in deploying international financial standards as diagnostic and prophylactic tools, however, has been decidedly mixed. Jordan asks, Do the waves of re-regulation and national regulatory retrenchment spell the end of internationalism in financial markets? Cally Jordan holds both civil and common law degrees from McGill University and a DEA from the Université de Paris I (Panthéon-Sorbonne). She also holds an MA from the University of Toronto. During her career, she has advised governments and international financial institutions around the world on corporate governance, capital markets and commercial law reforms. She has been a visitor at the Max Planck Institute (Hamburg) and the London School of Economics and Political Science, and is also a Research Fellow at the C.D.Howe Institute in Toronto. 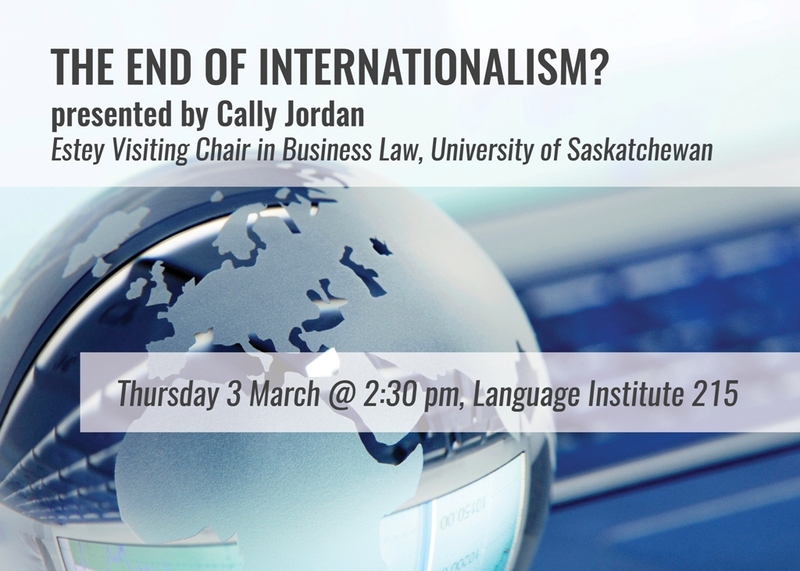 This lecture, which is part of the McKercher LLP Lecture series at the University Saskatchewan College of Law, is co-sponsored by the University of Regina President's Office, Faculty of Arts, and Paul J. Hill School of Business, and the Kenneth Levene Graduate School of Business. Admission is free and a short reception will follow the lecture. This lecture is open to members of the public. Metered parking is available across campus, and other paid parking is available in Lot 8. For further information, please contact: Dr. Stephen King by phone at 306-585-4086 or via email at: stephen.king@uregina.ca.